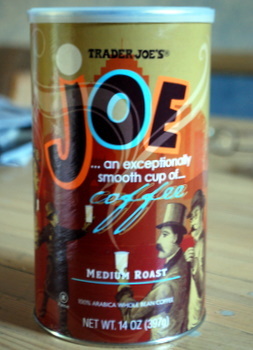 Trader Joe’s Joe Coffee appears to be the supermarket chain’s new house blend. It’s not a stretch to guess this, given the name, but another tell-tell factor is the price. This 14-oz can was just $3.99 (at my local TJs, prices may vary). Their coffees are usually a good deal, but this is easily the most affordable option on the shelf. As the house blend, Joe’s is designed to appeal to as many coffee drinkers as possible. It’s a medium-roast coffee, with a medium-low acidity and a medium body. There are notes of chocolate and some woodsiness, but it’s overall just a very smooth and drinkable cup that isn’t entirely remarkable. That’s not a bad thing! It means that it hits its mark as an everyday coffee that will appeal to a wide audience – and at the price point it’s at, the potential audience is pretty big.